This listing is for ONE Made To Match Tea Bag/Lemonade Packet Favor (envelopes/sleeves) PDF file. Tea has become increasingly popular to drink not only for the wide variety of flavors available now, but also for the wonderful health benefits. 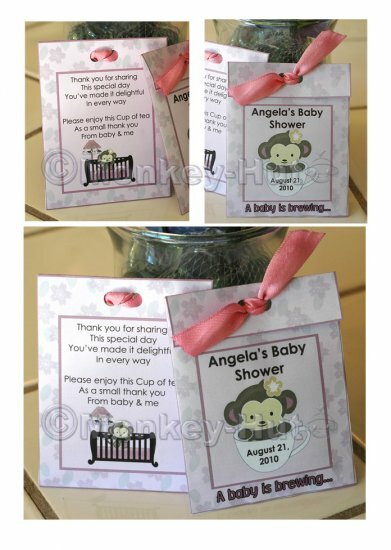 Perfect for baby showers or birthday parties, the personalized tea bag favors are a healthy and elegant gift that your guests will love. These unique favors can include your name and date and a personalized note on the back. They are a great way to say thank you for sharing in your special day. These are not just tea bag labels or favors with labels placed on tea bags, but tea favors slipped in a cute decorative packaging. Your PDF file will have two to a sheet. They are easy to assemble and you may print as many as you like. Choose your own flavor of TEA or LEMONADE packets. Tuck the pouches in the personalized bag sleeve and finish with a pretty satin ribbon. Finished size is approximately 3 ¾” high and 3” wide. Made to match any of my invitation designs. (1) Indicate invitation design you’d like to match (the one shown is the one that matches the Cocalo Jacana Monkey in ORCHID.) If no note is made is the one shown will be provided. 2. You will receive your personalized PDF file 0-3 BUSINESS days (not including holidays and weekends). cleared payment & all info has been received. VERY IMPORTANT NOTE: If it has been longer than 3 business days and you still have not received your item, please check your SPAM/JUNK folder. Hotmail accounts, as well as schools/government organizations, tend to put my email in SPAM or block them completely. Please make sure I can communicate with you by ensuring monkeyhutdesigns@gmail.com is an approved email sender in your filters. If your email provider is one of the above, please provide a secondary email address NOT through those providers. For PERSONAL USE ONLY. If you have any other questions, please do not hesitate to ask me. appear on the actual item you will receive. All artwork, products, and images are ©2000-2013 Connie Girga (aka Monkey-Hut / MonkeyHutDesigns). Artist retains copyright and artwork images are NOT to be reproduced in any way. All rights reserved.